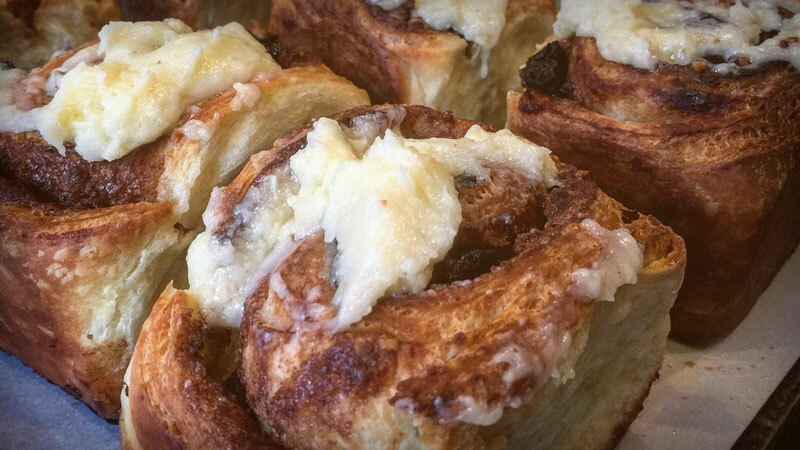 If there's one piece of food that I am a total sucker for, it's a good cinnamon roll. They are like chocolate chip cookies: very dependent on one's preferences. 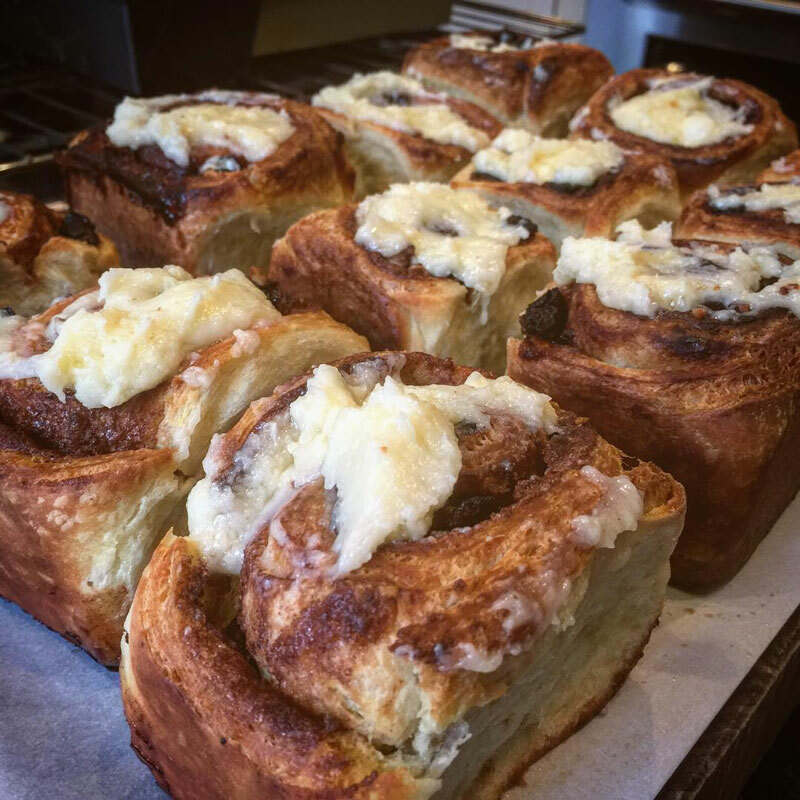 I am very particular about cinnamon rolls, but almost always happy with any attempt. I've learned to make them exactly like I like them: flaky, full of cinnamon goodness, and with all embellishments possible. I use a layered dough. I soak the raisins. I make the cream cheese frosting. I don't make these often, because these are the most decadent pieces of goodness I know how to make. The base recipe for this came from the Baker's Dozen Cookbook. The day before, but the raisins and rum in a small bowl and let them sit. Pour the milk into a large bowl and sprinkle with the yeast on top. Let stand until the yeast dissolves, about 5 minutes. Add the granulated sugar, egg, and vanilla and mix well. Stir in 2 cups flour, then the salt. Gradually stir in the remaining flour to make a soft, shaggy dough. Turn out onto a floured surface and knead by hand a few times, just until it holds together. The dough will look rough. Wipe out any excess dough from the bowl. Return the dough to the bowl. Cover tightly and let stand at room temperature until doubled in volume, about 2 1/2 hours. In a small bowl, work the butter with a rubber spatula until it is smooth and malleable but still cool. The butter should be as pliable as the dough. Starting at a short end, spread the butter evenly over two-thirds of the dough. Fold the dough into thirds like a business letter: Fold the unbuttered third of the dough over to cover one-third of the buttered section, then fold the exposed third over to complete the procedure. Roll out the dough again into a 17 X ll-inch rectangle. Repeat the folding procedure. Slip the dough into a large plastic bag or wrap in plastic wrap. Refrigerate for 2 hours. Remove the dough from the plastic. Roll again into a rectangle, then fold into thirds. Repeat the procedure. Return to the plastic bag and refrigerate for another 2 hours. To make the filling, mix the brown sugar and cinnamon in a small bowl. Set aside. Cut parchment to line the inside of a 9" x 13" pan. Allow the parchment to extend above the top of the pan. You'll use that to lift the whole set of rolls out of the pan. Remove the dough from the plastic. On a lightly floured surface, roll out the dough into an 18" x 9" rectangle. Sprinkle the cinnamon sugar over the dough, leaving a 1/2-inch border at one long side, and brush the border with water. Starting at the other long side, roll up the dough into a cylinder and pinch the seam closed. Using a sharp knife, cut crosswise into twelve slices. Place each slice into the baking pan. Cover the pan with plastic wrap and close tightly. Let stand at room temperature until the rolls have almost doubled in volume, about 1 hour. Position a rack in the center of the oven and preheat to 400°F. Take the plastic off the baking pan. Bake until the rolls are well browned and the sugar is bubbling, 20 to 25 minutes. Run a knife along the edge of the rolls. Lift the parchment so that the rolls come out of the pan. While the rolls are cooling, make the cream cheese frosting. In a mixer, mix the cream cheese and butter at a high speed until thoroughly mixed and fluffy. Add the vanilla. Slowly add the powdered sugar and mix just until fully mixed. Use an offset spatula to put a large dollop of frosting on each roll. 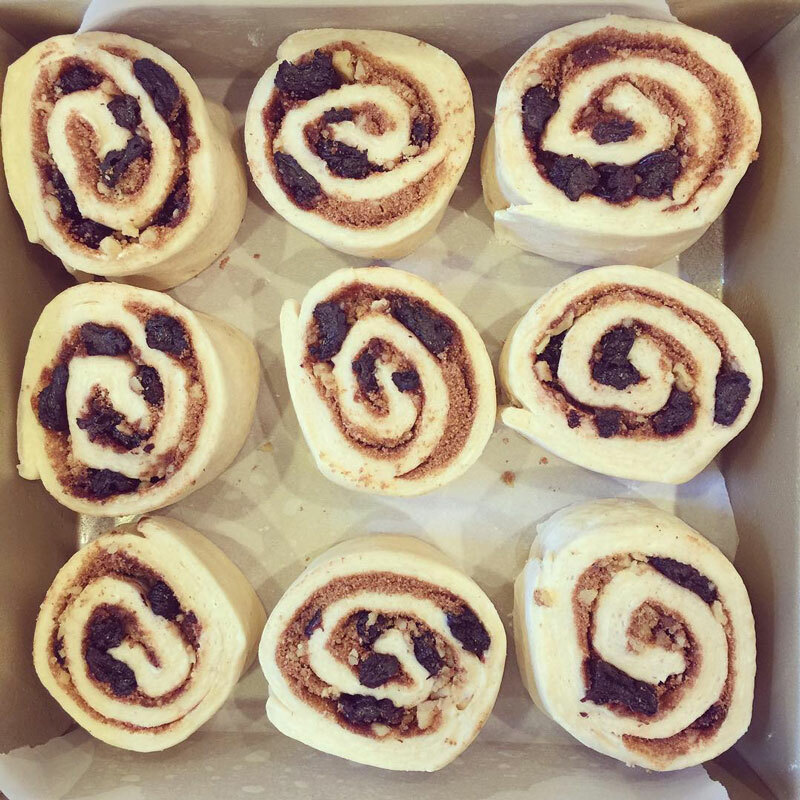 The rolls are best served when still a little warm.